As we think about the importance of curating the vast amount of information on the internet, it helps to have tools to assist us in our practice. We can begin by collecting resources that are valuable to us, comment on the value of the resource, and share it with our PLN. 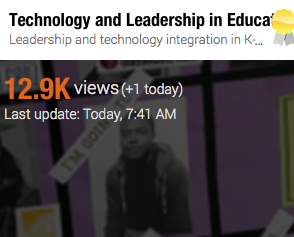 Similarly, we can use the same tools to tap into the resources that other educators have chosen, and read their insight into the importance of the information. 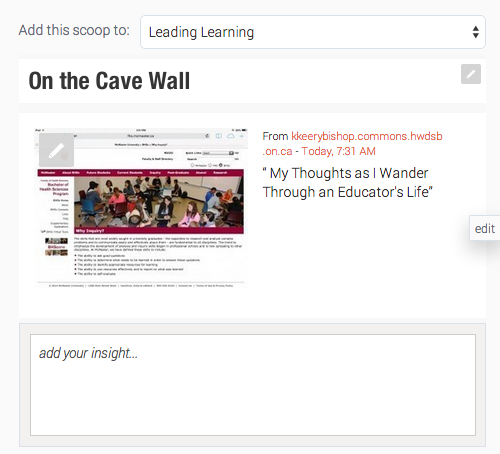 A simple tool to start us on the path of deeper and more meaningful curation is Scoop.it. 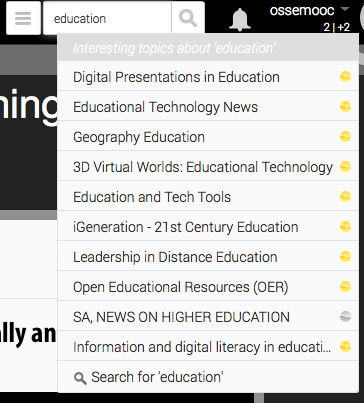 This tool was originally a free opportunity to build a number of “topics” to share resources. You will notice as we work through this that Scoop.it has now limited the number of free ‘topics’ you can have, and there is intrusive advertising asking you to upgrade your account. The concept behind how this tool works is still valuable to learn. Once you have used it, you may find that you want to migrate to a different tool without all of the advertising. Even if you don’t have a Scoop.It account, you can access links from other sites such as Twitter. 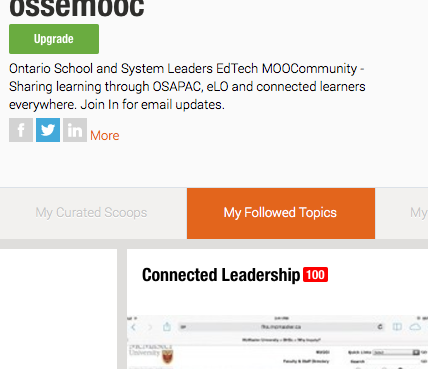 When you see the article on the Scoop.It page, even as a non-member, you can share it with your PLN on Twitter, Google+ or Facebook using the buttons below the article. Choose the “Join Free” green button in the top right corner. Choose “I don’t have a Facebook or Twitter account”, and fill in the form to sign up. 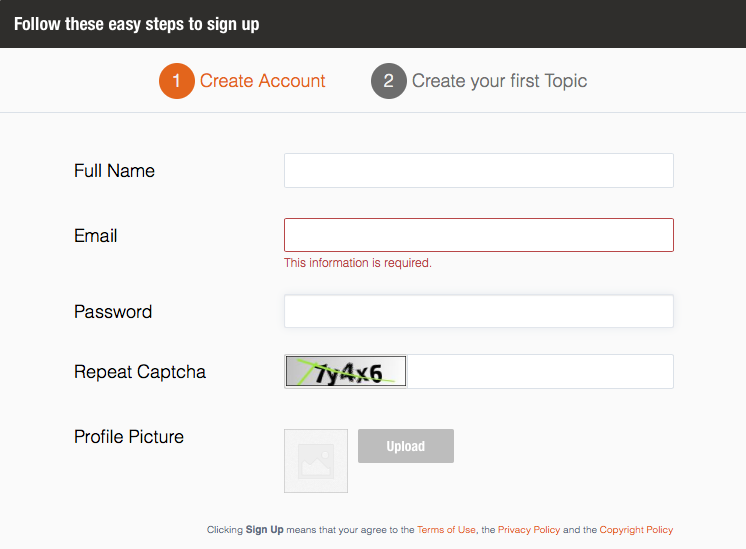 Your page will be created, and you will need to confirm the account in your email. Click the link and your account will be confirmed. You will be asked to select some areas of interest so that you have a stream of information to begin. Create a “topic”. 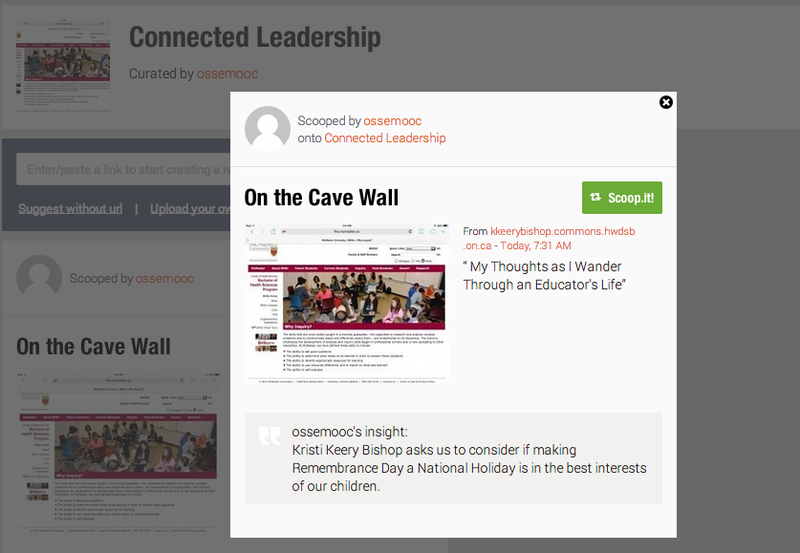 At OSSEMOOC, we chose “Connected Leadership” because that’s our purpose. 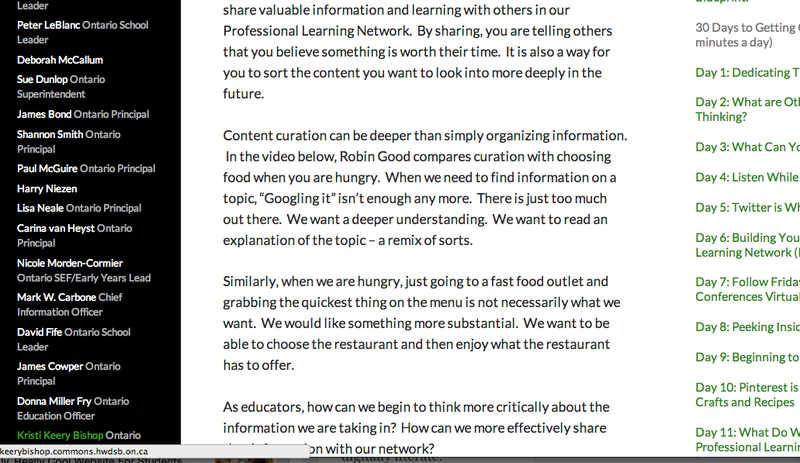 What will you curate information on? Starting with a fairly broad topic allows you to curate a wide array of resources. Starting with a narrow topic helps to fill a curation niche that may not already exist. It’s important to choose a topic you are passionate about. Now you are ready to start curating! 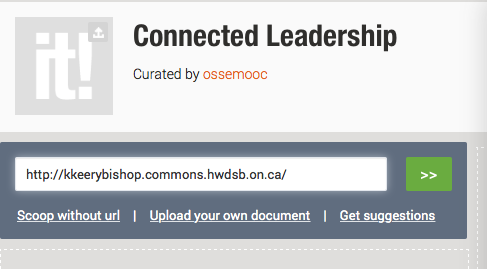 So let’s start by looking at what Ontario Leaders are writing about in their blogs. 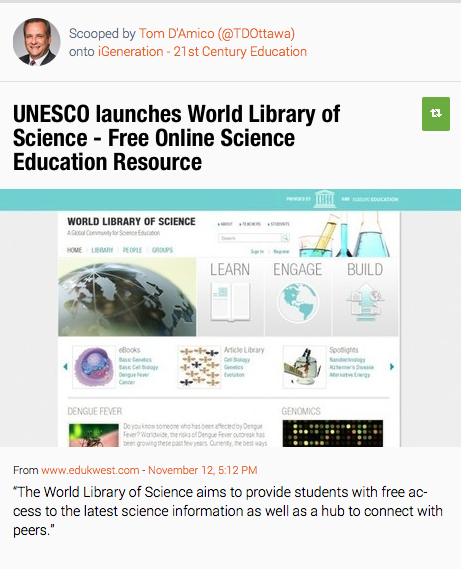 I will begin at https://ossemooc.wordpress.com/ and check out the blog links. 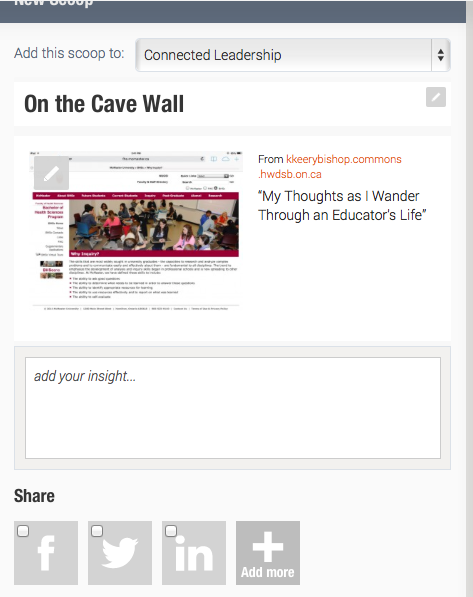 Kristy Keery Bishop is a diligent blogger and she often challenges our thinking. 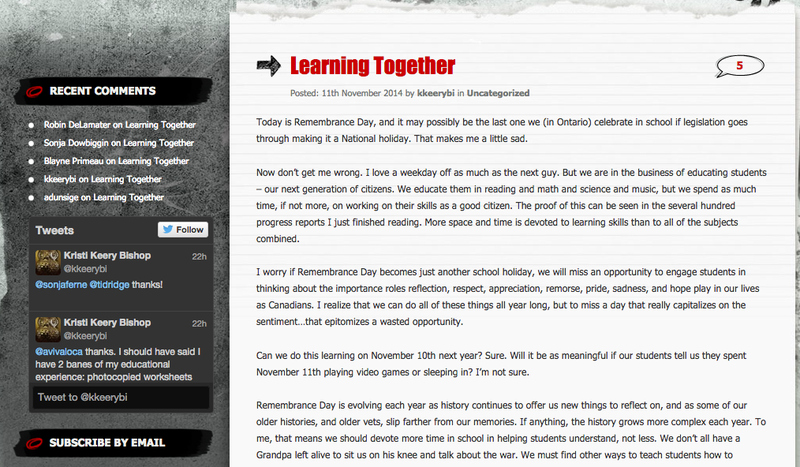 Today we can see that she has shared her thinking around the idea of Remembrance Day becoming a national holiday. 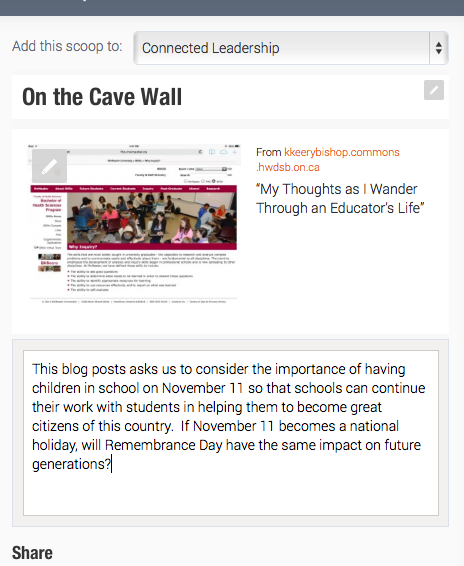 I want to share this post with my PLN, so I copy the link. 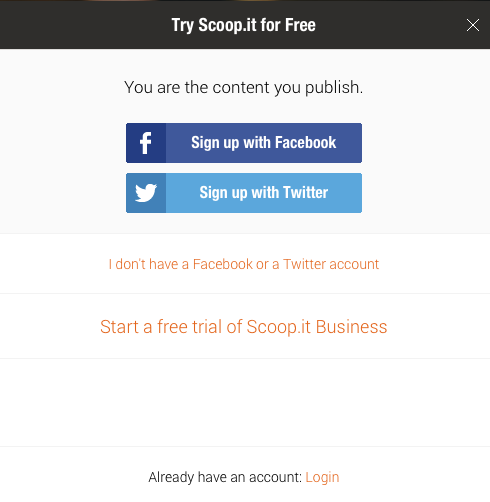 I past the link into the “new scoop” box and click the green double arrow button. Now I have a space below the post to add my own thinking (“add your insight”). This is where you curate. What did you learn from the post? What is valuable for other educators? What questions do you have? 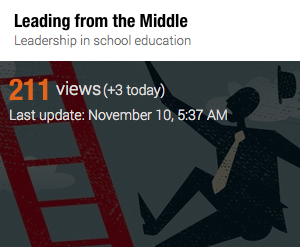 Your insights help other educators decide if they want to read this post. What would you want other curators to share with you to help you make this decision? 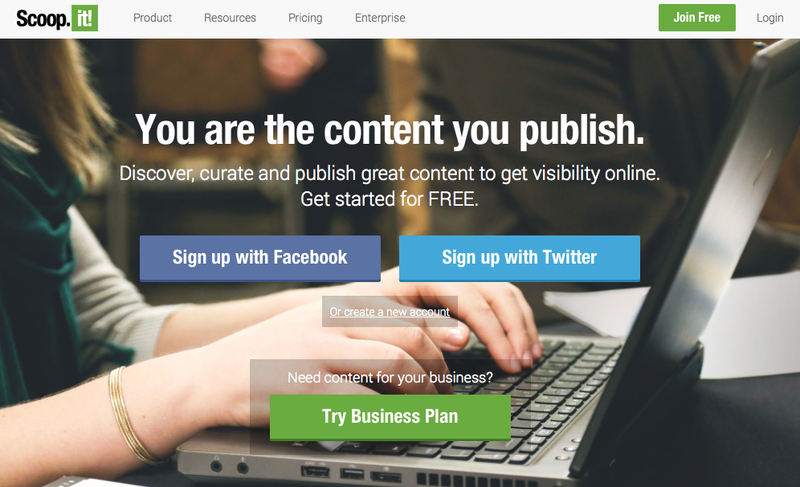 Click the green “Publish” button, and your first post is complete! 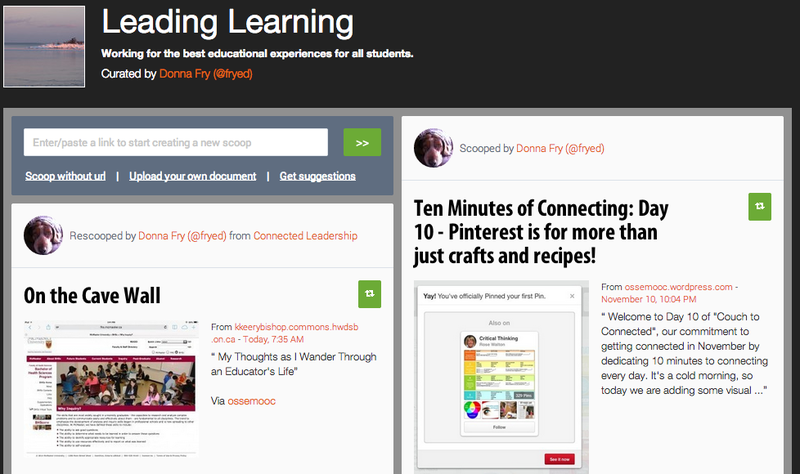 Now, let’s share your great work with your PLN on Twitter. Put your mouse on your posting and a series of icons appears at the bottom. Choose the right-pointing arrow in the bottom right, and sharing information will be displayed. Copy the URL, go to your Twitter account, and create a tweet that includes the URL. 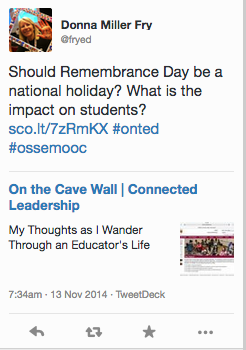 When your twitter PLN clicks on the link, they will see your posting and your comments. If they have a Scoop.It account, they can “rescoop” the posting, add their own comments, and post it on their own “Topic”. 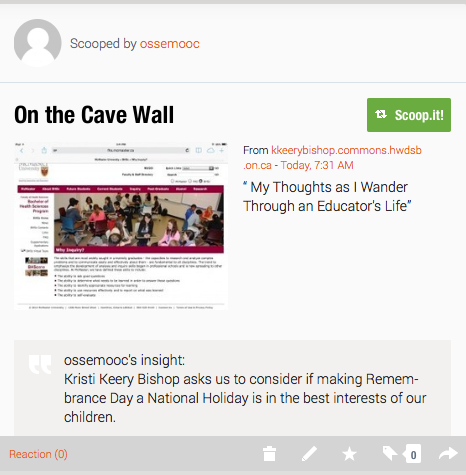 This is what it looked like when I ‘rescooped’ the OSSEMOOC posting to my own “Topic”. How can you “rescoop”? 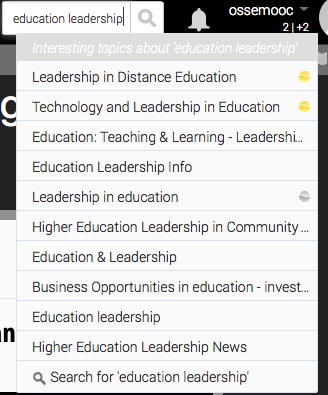 If you follow other topics, you will automatically see what others are scooping when you log in to your page. 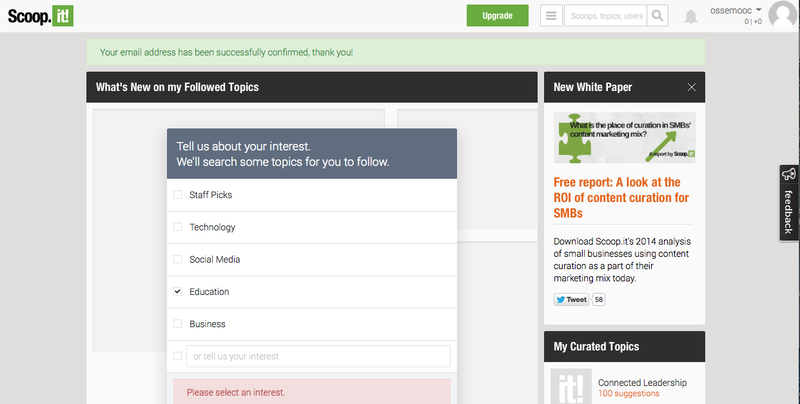 If you move from “My Curated Topics” to “My Followed Topic”, you can choose some other topics to follow. Enter your interest area into the search box, and suggestions are immediately populated. A number of topics will appear. It is tempting to follow all of them. First, let’s check to see how active they are. If I mouse over the topic, I get some details. 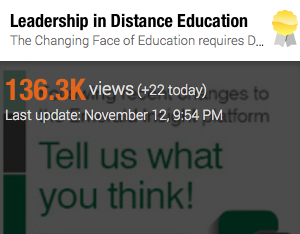 Education and Leadership is exactly what OSSEMOOC wants to follow, but when I look at the stats, I see that the last posting was almost two years ago. I don’t think I am going to get valuable new insights by following this topic! Similarly, this topic has a terrific title, but it has very few followers and no recent updates. By comparison, look at this! Lots of activity here! 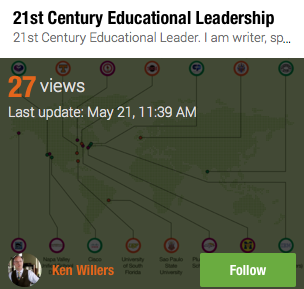 I think this might be a great place to learn more about what is happening in the world of Distance Education Leadership, so I will follow this one. This topic looks like it has a huge following as well, and it has regular updates. This one looks new, but active, and this is a topic we want to learn so much more about, so I choose to follow it as well. Now I can return to my own home page. And I can check out “My Followed Scoops” since I am now following some new topics. Tom D’Amico from Ottawa has scooped a very interesting science resource. 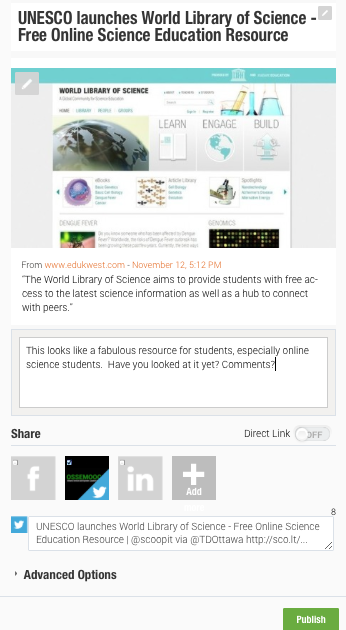 I can click the “rescoop” green button to automatically curate this resource and add it to my topic. I “add my insight”, which I admit is minimal at this point because I have not viewed the resource yet. After publishing this on my site, though, I can come back and edit my comments at any time. 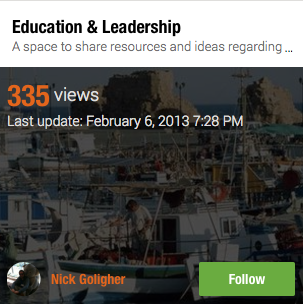 I can add value to my curated topics after I have spent more time with the resource. 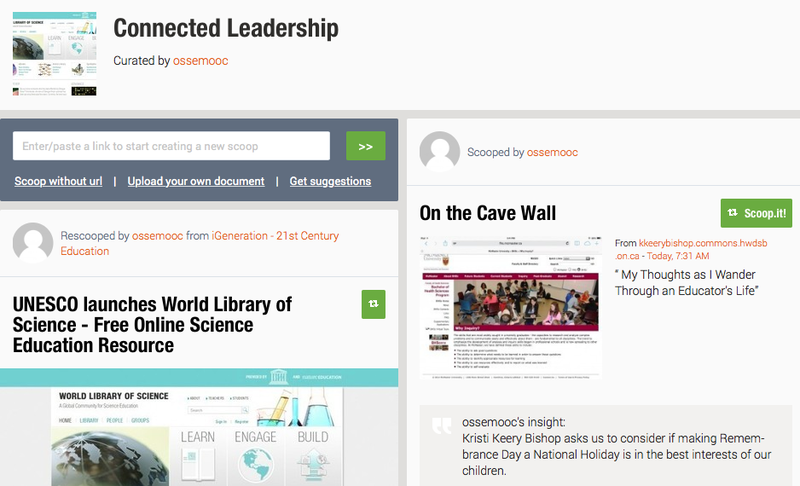 This is what the resource now looks like on the OSSEMOOC Topic page, and I can now share it with our PLN. 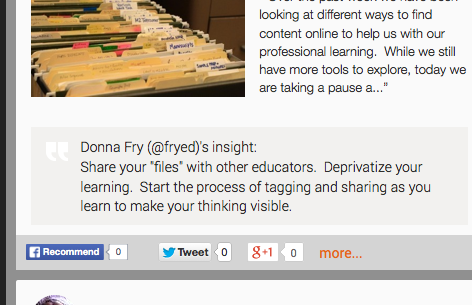 Now you are well on your way to curating resources, and sharing curated resources with your PLN. 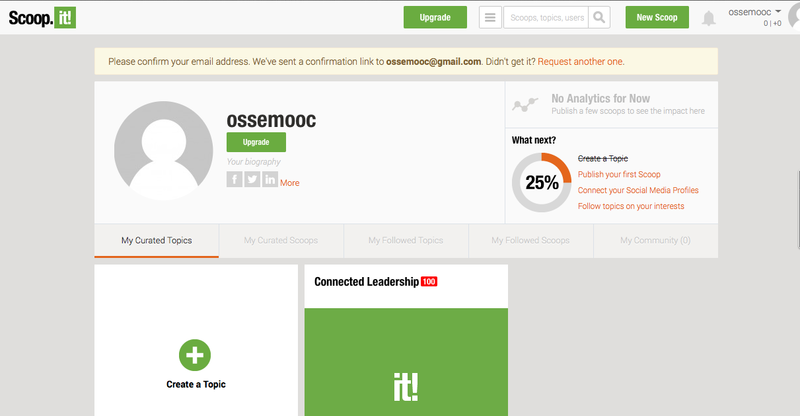 If you need help with this tool, please leave a comment on the OSSEMOOC blog. 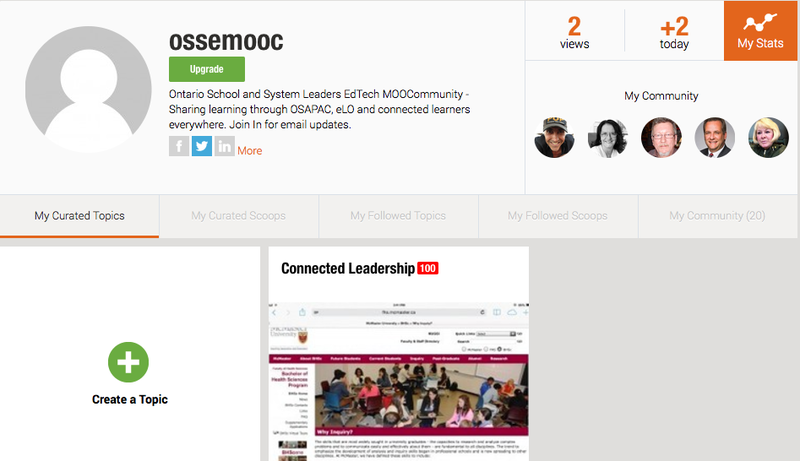 Follow the OSSEMOOC Scoop.It site here.